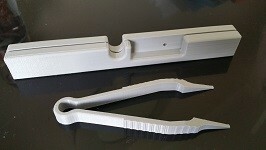 Rapid Prototyping in Melbourne by Industrial Plastic Solutions. IPS is now proud to be able to 3d print to a size of 200mm x 200mm x 180mm high. Realising 3d printing is the way of the future we have invested into being able to provide our current and new customers with this rapid prototyping service. Using materials such as PLA, ABS and HIPS, as well as specialty filament, we can provide a quick turnaround on all quotes as well as 3d printed jobs. Complex 3d printed components are our specialty and be assured we can help you with the design process. Industrial Plastic Solutions are now leading the way with rapid prototyping services which help new design engineers bring their concepts to life. If you have a broken part that is no longer able to be replaced by common suppliers call us. We can 3d scan your component and print out a new one when replacements are no longer available. This is especially cool on all old toys or game consoles especially that old prized possession that over time has taken a beating. When you need to prove a concept fast call us to 3d print your part, as we are the cheapest in Melbourne and provide a quick and reliable 3d printing service. Even if you have your own files but just need them 3d printed email us and send your (STL) file for quotation purposes.